The black and white stickers on the bottom or sides of products are often ignored by customers. However, a product's barcode is crucial. The distributing company must ensure that it adheres to federal standards for barcode labels, especially when it comes to certain food products or drugs from the pharmaceutical industry. Specific information must often be included in that coding. How do I pick the right barcode labels? Where do you begin when it comes to choosing the right equipment? Waiting for another firm to create and distribute your barcodes can take time, especially if the legal requirements change, and reprinting needs to take place. Yet if you work with DuraFast Label Company, we can help you find the right barcode printer and labels for your business needs. By using an Epson TM-C3500 barcode printer, for example, your company can print barcode labels at speeds of up to 3.7 inches per second in high-speed mode. Additionally, the labels can be printed up to 4" wide on rolls or fan-fed and in three resolutions: 360 x 180 dpi, 360 x 360 dpi, and 720 x 360 dpi. This is an ideal option for companies that need to print a large amount of barcode labels at once. Food producers and even pharmaceutical companies are two examples of industries that are likely to need a machine for mass amounts of printing. Why choose DuraFast Label Company barcode labels? 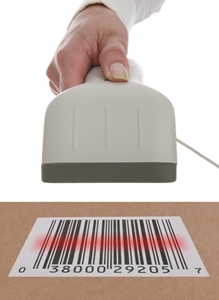 Our barcode labels will not smear or smudge, ensuring that your products remain distinguishable at all times. Furthermore, our DuraFast Label Company experts can keep you up-to-date on federal and local requirements, guaranteeing that your business is not fined for mislabeling items. Barcode labels are a product's passport, which is why nothing can be lost in translation. With durable label options from DuraFast Label Company, your business will remain on top of all manufacturing, producing and shipping needs. Contact one of our representatives today to find which machine is best for your need to design custom labels.